O most Blessed Mother, heart of love, heart of mercy, ever listening, caring, consoling, hear our prayer. As your children, we implore your intercession with Jesus your Son. Receive with understanding and compassion the petitions we place before you today, especially … (your special intention). We are comforted in knowing your heart is ever open to those who ask for your prayer. We trust to your gentle care and intercession, those whom we love and who are sick or lonely or hurting. Help all of us, Holy Mother, to bear our burdens in this life until we may share eternal life and peace with God forever. Amen. The Immaculate Heart of Mary originally The Sacred Heart of Mary is a devotional name used to refer to the interior life of Mary, her joys and sorrows, her virtues and hidden perfections, and, above all, her virginal love for her God, her maternal love for her Son, Jesus, and her compassionate love for all people. The consideration of Mary's interior life and the beauties of her soul, without any thought of her physical heart, does not constitute the traditional devotion; still less does it consist in the consideration of the Heart of Mary merely as a part of her virginal body. In 1855 the Mass of the Most Pure Heart formally became a part of Catholic practice. The two elements are essential to the devotion, just as, according to Roman Catholic theology, soul and body are necessary to the constitution of man. Generally (but with exceptions), Eastern Catholics do not utilize the image, devotion or theology associated with the Immaculate Heart of Mary, seeing it as a form of liturgical latinization. The Roman Catholic view is based on the Roman Catholic focus on Mariology, as exemplified by Pope John Paul II's Apostolic Letter Rosarium Virginis Mariae which builds on the total Marian devotion pioneered by Saint Louis de Montfort. 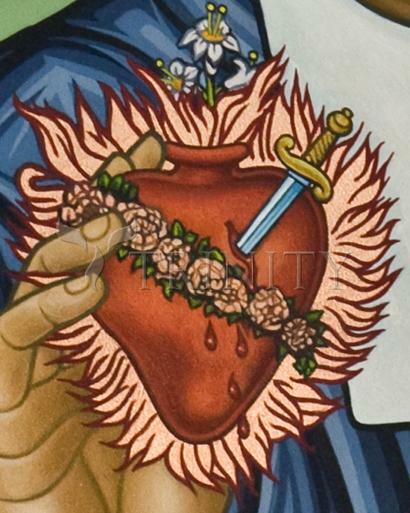 Traditionally, the heart is pierced with seven wounds or swords, in homage to the seven dolors of Mary. Consequently, seven Hail Marys are said daily in honor of the devotion. Also, roses or another type of flower may be wrapped around the heart. Veneration of the Heart of Mary is analogous to worship of the Sacred Heart of Jesus. It is, however, necessary to indicate a few differences in this analogy, the better to explain the character of Roman Catholic devotion to the Heart of Mary. Some of these differences are very marked, whereas others are barely perceptible. The Devotion to the Heart of Jesus is especially directed to the "Divine Heart" as overflowing with love for humanity. In the devotion to the Mary, on the other hand, the attraction is the love of this Heart for Jesus and for God. Its love for humans is not overlooked, but it is not so much in evidence nor so dominant. A second difference is the nature of the devotion itself. In devotion to the Sacred Heart of Jesus, the Roman Catholic venerates in a sense of love responding to love. In devotion to the Heart of Mary, study and imitation hold as important a place as love. Love is more the result than the object of the devotion, the object being rather to love God and Jesus better by uniting one's self to Mary for this purpose and by imitating her virtues. It would also seem that, although in the devotion to the Heart of Mary the heart has an essential part as symbol and sensible object, it does not stand out as prominently as in the devotion to the Heart of Jesus; devotion focuses rather on the thing symbolized, the love, virtues, and sentiments of Mary's interior life. The Immaculate Heart has also been involved in (and been depicted) in saintly Marian apparitions such as those to Saint Catherine Labouré in 1830 and appears on the Miraculous Medal. On the Miraculous Medal, the Immaculate Heart is pierced by a sword. The Sacred Heart of Jesus also appears on the medal, next to the Immaculate Heart, but is crowned with thorns, rather than being pierced by a sword. The M on the medal signifies the Blessed Virgin at the foot of the Cross when Jesus was being crucified. She promised that, whoever would ever do this, would be given at the hour of his death, the graces necessary for salvation. The history of the devotion to the Heart of Mary is connected on many points with that to the Heart of Jesus. The attention of Christians was early attracted by the love and virtues of the Heart of Mary. The gospels recount the prophecy delivered to her at Jesus' presentation at the temple: that her heart would be pierced with a sword. This image (the pierced heart) is the most popular representation of the Immaculate Heart. The St. John's Gospel further invited attention to Mary's heart with its depiction of Mary at the foot of the cross at Jesus' crucifixion. St. Augustine said of this that Mary was not merely passive at the foot of the cross; "she cooperated through charity in the work of our redemption." Another Scriptural passage to help in bringing out the devotion was the twice-repeated saying of Saint Luke, that Mary kept all the sayings and doings of Jesus in her heart, that there she might ponder over them and live by them. A few of Mary's sayings, also recorded in the Gospel, particularly the Magnificat (the words Mary is reported to have said to describe the experience of being pregnant with Jesus), disclose new features in Marian psychology. Some of the Church Fathers also throw light upon the psychology of Mary, for instance, Saint Ambrose, when in his commentary on The Gospel of Luke he holds Mary up as the ideal of virginity, and Saint Ephrem, when he poetically sings of the coming of the Magi and the welcome accorded them by the humble mother. Some passages from other books in the Bible are interpreted as referring to Mary, in whom they personify wisdom and her gentle charms. Such are the texts in which wisdom is presented as the mother of lofty love, of fear, of knowledge, and of holy hope. In the New Testament Elizabeth proclaims Mary blessed because she has believed the words of the angel who announced that she would become pregnant with Jesus, although she was still a virgin; the Magnificat is an expression of her humility. In answering the woman of the people, who in order to exalt the son proclaimed the mother blessed, Jesus himself said: "Blessed rather are they that hear the word of God and keep it." The Church Fathers understood this as an invitation to seek in Mary that which had so endeared her to God and caused her to be selected as the mother of Jesus, and found in these words a new reason for praising Mary. St. Leo said that through faith and love she conceived her son spiritually, even before receiving him into her womb, and St. Augustine tells us that she was more blessed in having borne Christ in her heart than in having conceived him in the flesh. It is only in the twelfth, or towards the end of the eleventh century, that slight indications of a regular devotion are perceived in a sermon by St. Bernard (De duodecim stellis), from which an extract has been taken by the Church and used in the Offices of the Compassion and of the Seven Dolours. Stronger evidences are discernible in the pious meditations on the Ave Maria and the Salve Regina, usually attributed either to St. Anselm of Lucca (d. 1080) or St. Bernard; and also in the large book "De laudibus B. Mariae Virginis" (Douai, 1625) by Richard de Saint-Laurent, Penitentiary of Rouen in the thirteenth century. In St. Mechtilde (d. 1298) and St. Gertrude (d. 1301) the devotion had two earnest adherents. A little earlier it had been included by St. Thomas Becket in the devotion to the joys and sorrows of Mary, by Blessed Hermann (d.1245), one of the first spiritual children of Saint Dominic, in his other devotions to Mary, and somewhat later it appeared in St. Bridget's "Book of Revelations." Johannes Tauler (d. 1361) beholds in Mary the model of a mystical soul, just as St. Ambrose perceived in her the model of a virginal soul. St. Bernardine of Siena (d.1444) was more absorbed in the contemplation of the virginal heart, and it is from him that the Church has borrowed the lessons of the second nocturn for the feast of the Heart of Mary. St. Francis de Sales speaks of the perfections of this heart, the model of love for God, and dedicated to it his "Theotimus." During this same period one finds occasional mention of devotional practices to the Heart of Mary, e.g., in the "Antidotarium" of Nicolas du Saussay (d. 1488), in Julius II, and in the "Pharetra" of Lanspergius. In the second half of the sixteenth century and the first half of the seventeenth, ascetic authors dwelt upon this devotion at greater length. It was, however, reserved to Saint Jean Eudes (d. 1681) to propagate the devotion, to make it public, and to have a feast celebrated in honor of the Heart of Mary, first at Autun in 1648 and afterwards in a number of French dioceses. He established several religious societies interested in upholding and promoting the devotion, of which his large book on the Coeur Admirable (Admirable Heart), published in 1681, resembles a summary. Jean Eudes' efforts to secure the approval of an office and feast failed at Rome, but, notwithstanding this disappointment, the devotion to the Heart of Mary progressed. In 1699 Father Pinamonti (d. 1703) published in Italian a short work on the Holy Heart of Mary, and in 1725, Joseph de Gallifet combined the cause of the Heart of Mary with that of the Heart of Jesus in order to obtain Rome's approbation of the two devotions and the institution of the two feasts. In 1729, his project was defeated, and in 1765, the two causes were separated, to assure the success of the principal one. The Alliance of the Hearts of Jesus and Mary is based on the historical, theological and spiritual links in Catholic devotions to the Sacred Heart of Jesus and the Immaculate Heart of Mary. The joint devotion to the hearts was first formalized in the 17th century by Saint Jean Eudes who organized the scriptural, theological and liturgical sources relating to the devotions and obtained the approbation of the Church, prior to the visions of Saint Marguerite Marie Alacoque. In the 18th and 19th centuries the devotions grew, both jointly and individually through the efforts of figures such as Saint Louis de Montfort who promoted Catholic Mariology and Saint Catherine Labouré's Miraculous Medal depicting the Heart of Jesus thorn-crowned and the Heart of Mary pierced with a sword. The devotions, and the associated prayers, continued into the 20th century, e.g. in the Immaculata prayer of Saint Maximillian Kolbe and in the reported messages of Our Lady of Fatima which stated that the Heart of Jesus wishes to be honored together with the Heart of Mary. Popes supported the individual and joint devotions to the hearts through the centuries. In the 1956 encyclical Haurietis Aquas, Pope Pius XII encouraged the joint devotion to the hearts. In the 1979 encyclical Redemptor Hominis Pope John Paul II explained the theme of unity of Mary's Immaculate Heart with the Sacred Heart. In his Angelus address on September 15, 1985 Pope John Paul II coined the term The Alliance of the Hearts of Jesus and Mary, and in 1986 addressed the international conference on that topic held at Fátima, Portugal.